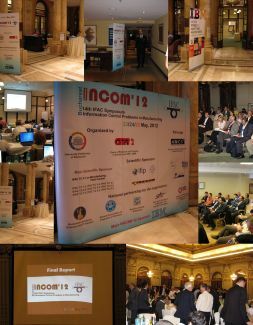 All the papers accepted for presentation at INCOM'12 were published in Preprints Volume (available only in CD-ROM) and provided for INCOM'12 participants. The material submitted for presentation at an IFAC meeting (Congress, Symposium, Conference, Workshop) must be original, not published or being considered elsewhere. All papers accepted for presentation will appear in the Preprints of the meeting and will be distributed to the participants. Proceedings of the IFAC Congress, Symposia, Conferences and Workshops will be hosted on-line on the IFAC-PapersOnLine.net website. 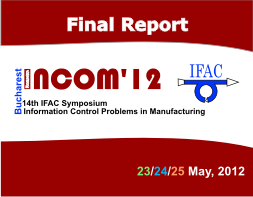 The presented papers will be further screened for possible publication in the IFAC Journals (Automatica, Control Engineering Practice, Annual Reviews in Control, Journal of Process Control, Engineering Applications of Artificial Intelligence, and Mecathronics), or in IFAC affiliated journals. 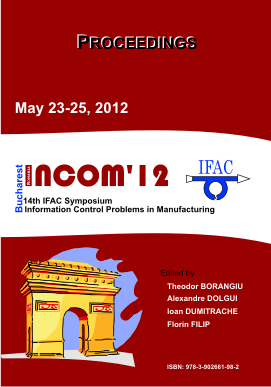 All papers presented will be recorded as an IFAC Publication. 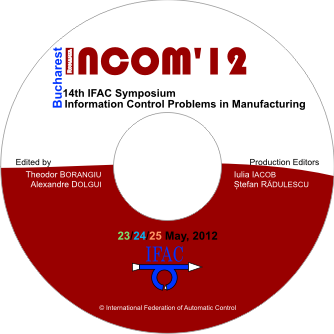 Copyright of material presented at an IFAC meeting is held by IFAC. Authors will be required to transfer copyrights electronically and/or in hard copy. 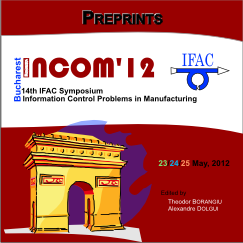 The IFAC Journals and, after these, IFAC affiliated journals have priority access to all contributions presented. However, if the author is not contacted by an editor of these journals, within three months after the meeting, he/she is free to submit an expended version of the presented material for journal publication elsewhere. In this case, the paper must carry a reference to the IFAC meeting where it was originally presented and, if the paper has appeared on the website IFAC-PapersOnLine.net, also a refernce to this publication.